Stainless Steel, Non Sterile, individually boxed. 9904 Braithwaite Handle with 2 Boxes of 10 Sterile 158mm Stainless Steel skin graft blades. 9905 Cobbett Handle with 2 Boxes of 10 Sterile 158mm Stainless Steel skin graft blades. 9906 Watson Handle with 2 Boxes of 10 Sterile 158mm Stainless Steel skin graft blades. Handles are supplied Non Sterile. The Handles and Handle Sets are Special order only. Normally within 5 to 7 working days. The 158mm Stainless Steel Sterile Blades are in boxes of 10 Blades ( ref 9940 ). 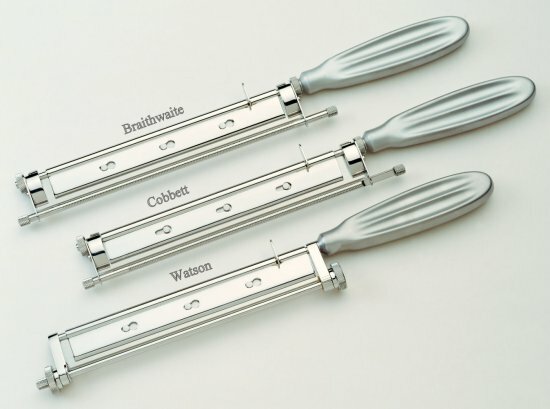 Fitment: Fits Braithwaite, Cobbett and Watson Skin Graft Handles.